Hi! 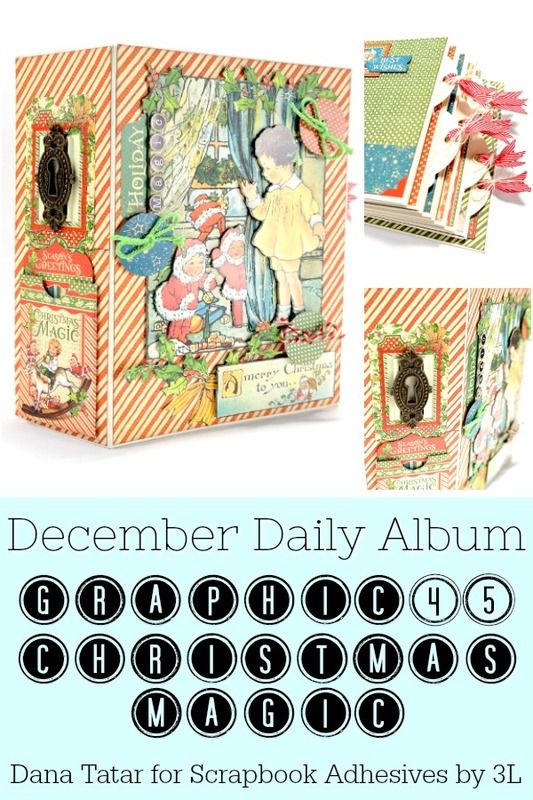 I'm sharing the December Daily Album I created for Scrapbook Adhesives by 3L Christmas Inspiration Week featuring Graphic 45 today. 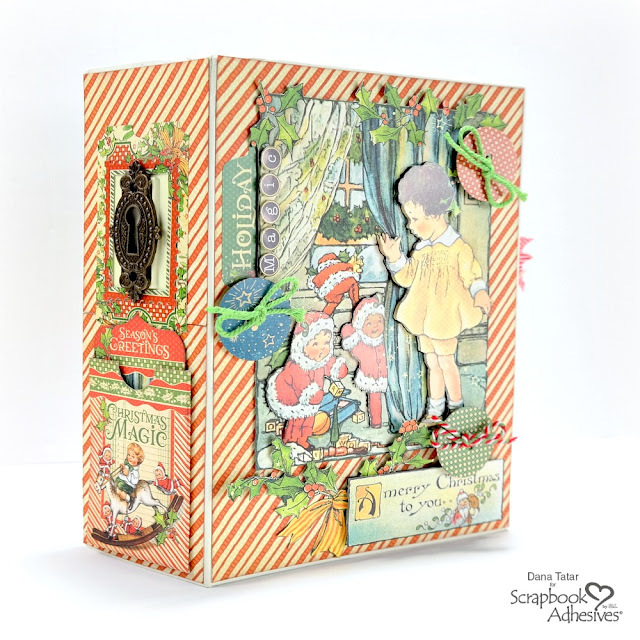 I used the beautiful Graphic 45 Christmas Magic collection. When I saw the Countdown Surprise patterned paper I knew I wanted to make a December Daily album. The Tag and Pocket Album is the perfect way to store and display photos and keepsakes from the month. I used Extreme and Ultra Strong adhesive products so I know this album will stand up to handling for many years to come. There is plenty of space inside the pockets, and on the back of journaling cards and tags, to add important memories and additional photos that don't fit onto the album pages. The Thin 3D Foam Squares add just the right amount of dimension to die-cuts and tags when space is limited in a pre-bound album. I had an absolute blast altering this album. I think I would still be working, cutting and layering die-cuts and patterned papers, if I didn't run out of supplies! I really love the mix of patterns in this collection. The addition of blue to the traditional red and green seasonal palette helps to add interest to the pages with a bold pop of color. I hope you enjoy the flip-through video. Please leave me a comment below if you have any questions about album assembly or adhesive. HomeHobby by 3L Extreme Double-Sided Tape 1/8in. I hope I have inspired you to get creative! 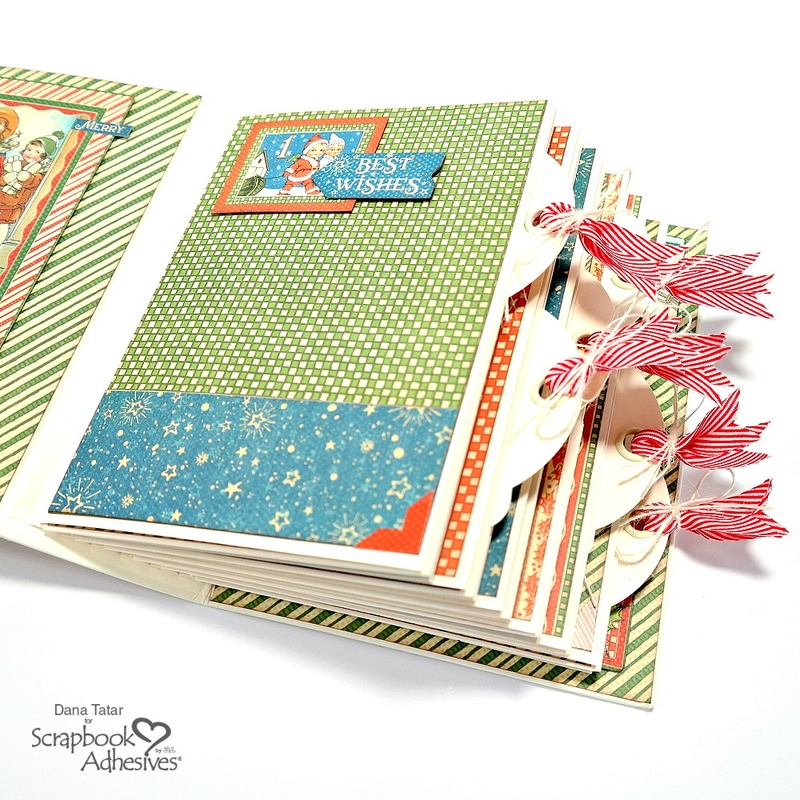 Don’t forget to look for the Holiday Gift Giveaway details on the Scrapbook Adhesives by 3L blog! Wow wow wow wowwwwwwwwwwwwwww!!! This is STUNNING!!!! I am IN LOVE!!!!!! !